The Gospel is good news for women. Scripture opens up liberty for all people, particularly women, and particularly with a liberty to follow God’s calling in the world. The church is to be the site where women are most heard and most valued, and thus should also be given opportunity to lead, not being held back. Here we will go through all the women leaders of the Bible. The amount may surprise you. Often those that would restrict the Spirit will cite a handful of proof texts in the New Testament as universal commands and patterns for gender in the church, rather than situation-specific commands to promote order in disorderly churches. As we go through all these examples, we begin to see an inductive necessity for seeing those proof texts as contextual. The narrative of Scripture simply does not conform to rigid gender patterns. Judges 4:4: Now Deborah, a prophet, the wife of Lappidoth, was judge over Israel at this time. She held court under the Palm of Deborah between Ramah and Bethel in the hill country of Ephraim, and the Israelites went up to her to have their disputes decided. Notice a few things: Debroah is a prophet, a true prophet. You can only become a prophet if God picks you. A prophet is someone, if they are authentic, who communicates messages from God to the people. This might be something more intuitive like how a pastor can preach prophetically from God’s Word yet has not heard the direct audible voice of God. Martin Luther King, Jr. was in many ways a contemporary prophet in that regard. However in its most common form in the Old Testament, a prophet hears directly from God. Jeremiah describes hearing God and penning what he heard (Jer. 36:2). While authentic prophecy has to be discerned by God’s people (1 Cor. 14:26-33), a prophet is the highest religious authority for God’s people, higher than elders, higher than priests, higher than the king. As we will see, there were a lot of female prophets. Deborah was a judge. She held court over all Israel. She was a judicial-political figure over all of Israel, all the people of God, and they were okay with that. What is even more interesting about that is that the qualifications of judges, given in Exodus 18, states that judges must be “men who fear God.” Apparently God and God’s people saw the description of “men” to be generic and inclusive. They did not have a problem with a women leading God’s people, provided she had the calling and ability. It was less common, yes, but it was not forbidden, even in a patriarchal culture. Fast forward to the New Testament and we see something analogous: in 1 Tim 3:2 and Titus 1:7 an overseer or bishop is described as a being male, using only masculine pronouns. These function as the New Testament equivalent of judges for the community. So, if the qualifications of judges in the Old Testament uses male pronouns as does the New Testament office, yet in the Old Testament there is a judge installed that is female and this is permissible, it stands to reason that the male description in the New Testament is inclusive also. The Bible, in its culture, had not problem saying a woman is the right “man” for the job. Deborah was also a military leader. This story in Judges continues on to describe how an evil warlord Sisera attacks Israel. Barak, a male judge, refuses to fight Sisera unless Deborah comes with him. While he places a lot of confidence in her, Barak is also being a big coward. Deborah agrees to come and fight (despite war not being a female gender role of the time) and she prophetically declares that God will use a woman to shame and defeat Sisera. While Deborah commands the army and defeats Sisera, Sisera runs and hides in a tent where a woman named Jael kills him by stabbing him with a tent peg while he was sleeping, which is a very humiliating way to die. The story of Deborah shows that God can choose women to lead God’s people in all areas (military, religious, and government) and in fact, God chooses women to shame the brutality of some men. After all, he chooses the (supposedly) weak to shame the (supposedly) strong (1 Cor. 1:27). II Kings 22: 14-20 (cf. II Chr. 34: 22-28): Hilkiah the priest, Ahikam, Akbor, Shaphan and Asaiah went to speak to the prophet Huldah, who was the wife of Shallum son of Tikvah, the son of Harhas, keeper of the wardrobe. She lived in Jerusalem, in the New Quarter. She said to them, “This is what the Lord, the God of Israel, says: Tell the man who sent you to me, ‘This is what the Lord says: I am going to bring disaster on this place and its people, according to everything written in the book the king of Judah has read. Because they have forsaken me and burned incense to other gods and aroused my anger by all the idols their hands have made, my anger will burn against this place and will not be quenched.’ Tell the king of Judah, who sent you to inquire of the Lord, ‘This is what the Lord, the God of Israel, says concerning the words you heard: Because your heart was responsive and you humbled yourself before the Lord when you heard what I have spoken against this place and its people—that they would become a curse and be laid waste—and because you tore your robes and wept in my presence, I also have heard you, declares the Lord. Therefore I will gather you to your ancestors, and you will be buried in peace. Your eyes will not see all the disaster I am going to bring on this place.’ So they took her answer back to the king. While there is other accounts of women prophets such as Miriam (Ex. 15:20-21), Isaiah’s wife (Isa. 8:3), Noadiah (Neh. 6:14), or Anna (Luke 2:36), these are mentioned in passing. Huldah provides an interesting case. Here Josiah, a good king, discovers the Book of the Law, forgotten in the temple. He sends his officials to Huldah to see if this will prevent the immanent judgment of God against Jerusalem (2 Kings 22:1-13). They go to Huldah, while Huldah comforts Josiah (she says the judgment will not occur during his life) she also blasts him, rather irreverently: “Tell that man who sent you this…” Why so feisty? Rabbinical commentators point out that Jeremiah was around prophesying coming judgment, it would have made more sense to talk to him. However, the king is going to a female prophet, perhaps to push or manipulate her into saying something for his benefit. Huldah has none of it, and she definitely takes him down a notch. So notice what is going on here: This indicates that a women, by her religious calling, has more authority than God’s anointed king. King Josiah goes to her to get approval, and Huldah rebukes him. Huldah was a sharp, feisty, and formidable prophet of God. This is what the empowering Word of God does. Acts 21:8-9: On the next day we departed and came to Caesarea, and we entered the house of Philip the evangelist, who was one of the seven, and stayed with him. He had four unmarried daughters, who prophesied. The Book of Acts begins with Peter excited that a new age is here, prophesied by Joel: “In the last days it will be, God declares, that I will pour out my Spirit upon all flesh, and your son and daughters will prophesy” (Acts 2:17 cf. Joel 2:28). As evidence of this, mentioned in passing, Acts records an evangelist named Philip, who has four daughters who prophesy. Again, while true prophesy had to be discerned, prophets were the highest religious authority in the church next to the apostles, but above teachers: “God has appointed in the church first apostles, second prophets, third teachers…” (1 Cor. 12:29, cf. Eph. 2:20; 4:11). This is important. Prophets are listed by Paul as higher ranking than teachers. Yet, in 1 Tim. 2, he bars women from teaching, and in 1 Cor. 14, the interpolation there prevents women from speaking (probably during a very specific time in service). This should be a red flag notifying us that 1 Tim. 2 and 1 Cor. 14 are situational, not universal. Prophets were teachers and they taught in the assembly. Moses gave the law as a prophet and teacher, the two being one and the same. You cannot prophecy without teaching, but you can teach without prophesy. Prophesy is similar but superior. Prophesy was done in the church by women. How do we know? Look at the context of one of the most infamous “headship” passages, 1 Cor. 11, which actually insists on head coverings to show authority when women prophesy. The head covering seems to be a cultural expression that Paul is using to maintain some sense of decorum, as indicated by the often mistranslated statement at the end: if anyone is contentious on this “it is only a custom” v. 16). But make no mistake: whatever one’s view of the male-female relationship and the coverings of 1 Cor. 11, this passage shows that the covering actually shows the authority of a woman (not the submission!) when she prophecies in a church (v. 10)! All things considered, there is no reason why a woman cannot give the sermon on a Sunday. Preaching is not a action restricted to an office. It is the gift of the Spirit. Philip’s daughters may have been his back-up preaching team in his evangelistic work. Whatever this means, you know that guy was a proud parent. The text makes a point of saying that they are unmarried, which means they very likely are young women also. Perhaps this was Luke’s (the author of Acts) way of saying “and fellas, they are single,” or it reiterates that these women were good at what they did, despite their youth. They were not discriminated against because of their gender, demeaned as too delicate for ministry. Acts 18: 24-26: Now there came to Ephesus a Jew named Apollos, a native of Alexandria. He was an eloquent man, well-versed in the scriptures. He had been instructed in the Way of the Lord; and he spoke with burning enthusiasm and taught accurately the things concerning Jesus, though he knew only the baptism of John. He began to speak boldly in the synagogue; but when Priscilla and Aquila heard him, they took him aside and explained the Way of God to him more accurately. Aquila was a Jewish Christian and exile from Italy (Acts 18:1-2). He and his wife are mentioned several times (Rom. 16:3-4; 1 Cor. 16:19; 2 Tim. 4:19). This indicates that this couple got around, and they did a lot of work for the Gospel. They were very likely traveling apostles. Here in Acts 18, we see this husband and wife team instructing a gifted teacher named Apollos, who apparently was discipled under John, knew Jesus, but was missing a few things. At any rate, the text makes a point that both Aquila and Priscilla took aside him and taught him. This should not be assumed to be just a quick chat, but rather hours of reasoning through Scriptures. It also should not be assumed that Priscilla sat there quietly leaving the men to talk. The text makes a point that both of them taught Apollos seemingly as equals. 1 Cor. 1:11: For it has been reported to me by Chloe’s people that there are quarrels among you, my brothers and sisters. This is an implicit example, but strongly suggestive nevertheless. Who is Chloe? Some want to write her off as just a concerned congregant, and she may be. However, Chloe has people under her. They report to her, and in turn, she has sent these people to report to Paul, regarding the spiritual affairs of the church of Corinth. She is apparently well known to the church as she needs no introduction like “Chloe, the wife of [someone more important that you know].” So we know that she is well known to the church, has people under her, and reports to Paul regarding the religious matters of the church. This sounds like a pastor or even a bishop/overseer of sorts. Colossians 4:15: Give my greetings to the brothers and sisters in Laodicea, and to Nympha and the church in her house. The early church had not formal buildings to meet in. So, often people would meet in homes. It was the norm that the person that owed the house usually was the leader of that house church. This is similar to small groups and house churches today. Thus, Nympha very likely was a sort of house church pastor. Romans 16: 1: I commend to you our sister Phoebe, a deacon of the church in Cenchreae. I ask you to receive her in the Lord in a way worthy of his people and to give her any help she may need from you, for she has been the benefactor of many people, including me. Some translations will say, “Phoebe, a servant of the church of…” in the sense of a beloved volunteer. That is possible, but unlikely. The word “deacon” is male, and just as Huldah and Deborah were described as “prophets” not “prophetesses,” the use of the male word was done to imply title and authority. Also, Paul uses the word “deacon” to describe his own ministry (1 Cor 3:5; 2 Cor. 3:6, 6:4, 11:23; Eph 3:7; Col 1:23, 25), which may indicate the importance of Phoebe’s work. The fact that she is of another church coming here also speaks to her having representative authority. She has been called in as a specialist to help the church in Rome. Romans 16:7: Greet Andronicus and Junia, my fellow Jews who have been in prison with me. They are outstanding among the apostles, and they were in Christ before I was. I have seen a lot of prejudiced translations intentionally mistranslate this passage to downplay Junia. For instance some translations say, “Junias… famous to the apostles.” However, there a lots of reasons why that translation does not work. First the oldest manuscripts we have say “Junia.” The manuscript that renders this word “Junias” has been demonstrated to be flawed. As scholars looked at the rest of the manuscript, it shows that it accidentally records several other female names as male. However, the biggest problem with this is that “Junias” is not a name in the Greco-Roman world. The root word for “Junia” means something feminine, so there are no known male versions known in the Roman world to corroborate and warrant it being translated as a male name. Also, the translation “famous to the apostles” is grammatically less sound than “among.” “Among” in this case is usually used to indicate that something is apart of something, like saying, “This hockey player is respected among his or her team mates.” Practically speaking, mentioning that Junia is merely famous to other apostles other than Paul does not rhetorically make much sense. Why would Paul bother pointing out how famous two people are among other apostles other than himself? It does not make much sense. It makes more sense that he is speaking of them as excellent apostles. Others have tried to render them as famous “messengers” (which is what “apostle” meant in Greek), however, Paul seems to reserve the word for a person who has similar authority and role to himself (although not as important as the 12 Apostles). Junia is not the first century version of a FedEx girl. For Paul, apostles, when mentioned, are never messengers, as seen in the case of Epaphroditus in Phil. 2:25: “I think it necessary to send to you Epaphroditus – my brother, co-worker, fellow soldier, your messenger/apostle and minister to my need.” Paul says Junia and Andronicus both endured prison with him. This means they – both of them – were doing similar work to him. So, the more likely translation is that these two people – probably an apostolic couple like Aquila and his wife, Priscilla – were prominent among the apostles, who are their colleagues. 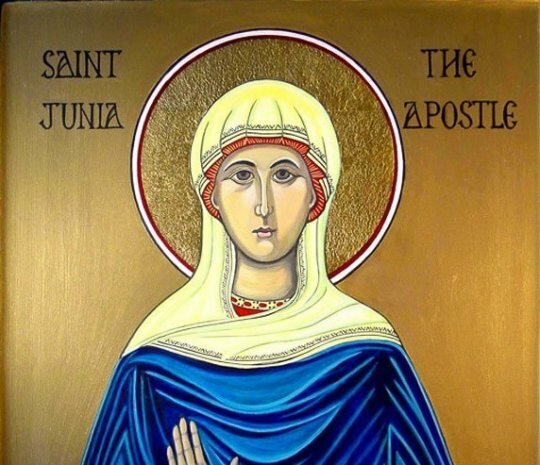 Junia, as far as we can infer then, was an apostle, having authority to proclaim the gospel, teach disciples, start churches, etc., all for which she was imprisoned, and so, apparently she was outstanding at what she did. Phil. 4:2-3: I plead with Euodia and I plead with Syntyche to be of the same mind in the Lord. Yes, and I ask you, my true companion, help these women since they have contended at my side in the cause of the gospel, along with Clement and the rest of my co-workers, whose names are in the book of life. Euodia and Syntyche are apparently having an argument and Paul wants them to resolve their differences for the sake of church ministry. They are described as Paul’s “co-workers,” at his “side” (connoting equality). Paul refers to Epaphroditus as a fellow “co-worker,” and he is also described as an “apostle” (Phil. 2:25). “Co-worker” is a description Paul uses to describe his fellow apostles often: Timothy (1 Thes. 3:2), Titus (2 Cor. 8:23), Justus (Col. 4:11), Priscilla and Aquila (Rom. 16:3), Urbanus (Rom. 16:9), and in general (cf. 1 Cor. 3:9; 2 Cor. 6:1). Euodia and Synteche are listed here along with a man named Clement for the “cause of the Gospel.” We know that Clement may have been the same Clement that went on to become overseer of the church in Rome, so these women are being described as being among an important group: the apostles. Many people cite, for example, 1 Timothy 2:11-12 as a command that limits women in the church today: “Let a woman learn in silence with full submission. I permit no woman to teach or to have authority over a man; she is to keep silent.” They take this to be a unilateral teaching that Paul applied in all his churches, representing the universal position for the church today. However, a good question to ask is why are these particular women in Ephesus so forcefully being barred from teaching? There are good reasons for that. We should also ask whether this lines up with what we see elsewhere in Scripture. Paul obviously would have been aware of Deborah and her position. When we see many other instances where women did in fact exercise high degrees of authority in the biblical narrative, we should do the work of good interpretation and consider that contextual factors might be in play in what Paul teaches. What Paul did to establish order in the church that Timothy oversaw might not be suitable today to further the ministry of the gospel. While much good can be said about traditional gender roles, marriages, families, etc., my sense of the matter is that we cannot turn gender roles into gender limits, much less gender stereotypes. While we must respect our differences as men and women, these are to be done within the framework of equal worth, equal opportunity, equal distribution of work, all in order to love each other better and to follow God’s calling for each of our lives. So, does the Bible have women leaders in it? Yep. It explicitly has apostles, judges, prophets, deacons, and while not mentioned by title, it also has teachers, pastors, and possibly, bishops. “Where the Spirit of the Lord is, there is freedom” (2 Cor. 3:17), and as Peter describes it in Acts, this is evidence that a new age is dawning, where the Spirit is being poured out on “all flesh” (cf. Joel 2:28), where the curse of patriarchy upon the daughters of Eve is being lifted (Gen. 3:16), where a new age of equality is here in which there is no longer “Jew or Gentile, male or female, slave or free, for all are one in Christ Jesus” (Gal. 3:28).